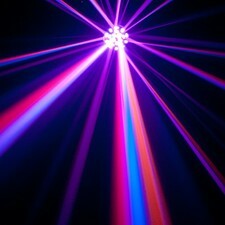 One of the most classic DJ effect lights of all time - the Vertigo. This is the latest version powered by two 12-Watt 6-IN-1 HEX LED technology. Six colors (Red, Green, Blue, Cyan, Amber, and White) built into one LED. This allows brighter output and more color options. 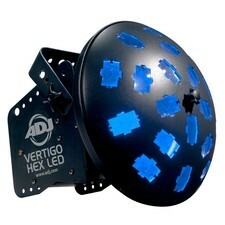 The Vertigo HEX LED has 60 sound activated reactions that move to the beat of the music and is easy to set up! Power In/Out connections have been added to conveniently daisy chain power from one fixture to the other.